Quiet reading2529 viewsNo quiet reading for Jerrin. The Bug has found him. Cover for WF 11163 viewsThis is the cover as it was published. It was changed by the publisher without consulting me. Imagine my surprise. Watergun Chase1138 viewsJerrin is so going to soak Tracey! Chair idea1047 viewsChair for a critter with a tail. Character lineup991 viewsKen Singshow's lineup of the characters. Victor the Bat, Talhain, Elisha, Rhea, Bravo the wolf. 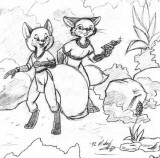 Space Game952 viewsThe kits hand Talhain his tail in a holographic space game! PLanetside Kits890 viewsThe kits are on another planet helping with samples. Jerrin pauses remembering his last trip. Hightail889 viewsThis is kind of a concept for the hightail. The true size and shape of the Hightail is not to be seen actually. It's as big as needed and for now, the exact size is not needed. All content © 1999-2011 Todd A. Starr except as otherwise noted. Site by Virmir.